This nine minute clip showing Steve Jobs launching iPod for the first time in 2001 is one of my favourite videos. I have watched it dozens of times, had several discussions on it in my innovation workshops, and referred to it in our book as well. Somewhere along with way a thought came – can we create a simple template from this video that others may find useful while presenting their ideas? In this article, I would like to present the template which came as a response to that question. Several of my workshop participants have found it useful and hence thought of sharing it. To appreciate the template, let’s break the presentation into three parts: Why, What and How. In this presentation, they answer the questions (1) Why music? (2) What is iPod? (3) (Let me show you) How it fits into my pocket. Why music? In the “Why” part, Jobs tells us why this space of digital music was important to Apple at that juncture. Through following table, Jobs communicates the options available, associated trade-offs and the position Apple had taken (to go for hard drive option). What is iPod? 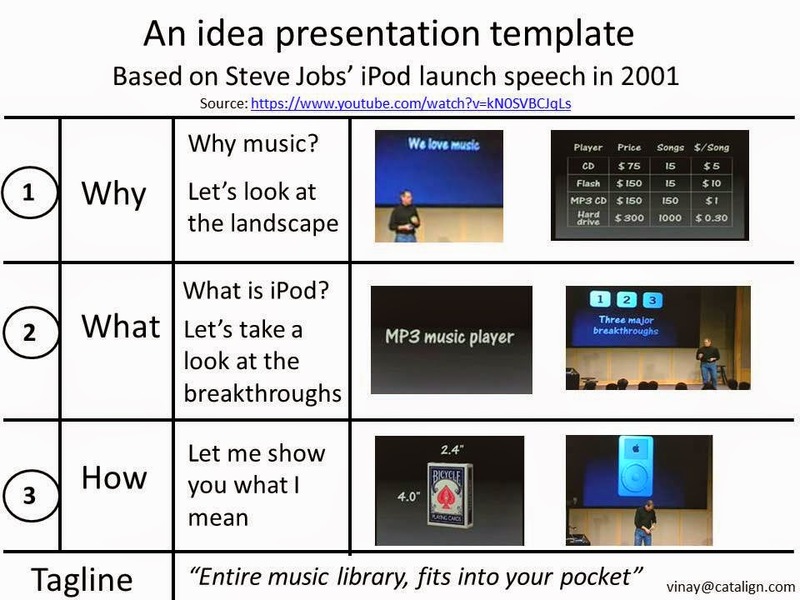 In the “What” part, Jobs presents brief description of what iPod is – an MP3 music player, has CD-quality music and it plays all of the popular open formats of the digital music, holds 1000 songs and fits in your pocket. He unleashes the tagline – Your entire music library fits into your pocket. He articulates the three things unique about the iPod – storage, portability and design. He also highlights several user scenarios such as iPod running out of charge. Note how Jobs covered a few what-if scenarios. E.g. What-if I am on the road and my battery is dead? What-if I have to transfer CD to iPod? Let me show you: The easiest way to build credibility is to showcase a key feature of your idea. Here Jobs shows the picture of iPod on the screen (design) and then shows how the iPod fits into his pocket (portability). The three aspects of the this presentation: Why-What-How can be extended to any idea. Following picture illustrates the template. The template incorporates three core communication design principles: curiosity flow, concreteness and credibility. Curiosity flow is introduced through Why-What-What-if-How questions. Concreteness is ensured through what-if scenarios, by showing experiential imagery like the deck of cards and by showing the demo. Credibility is enhanced by showing a trade-off analysis table and by showing a working demo. Note that unlike Steve Jobs establishing credibility is the most difficult of the three aspects for most idea presenters. 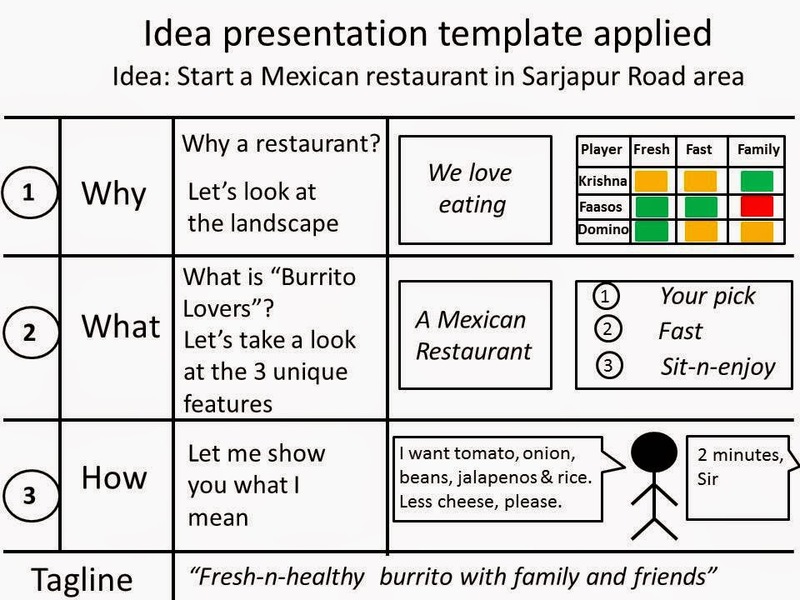 Here is an example where the template is applied to an idea of starting “A Mexican restaurant in Sarjarpur Road area” (where I live). It is a fictitious example and hence used for illustration purpose only. Koel, Thanks for bringing out similarity between the template and the Impact Map. I also wonder if "How much" would be relevant in a typical business case presentation as there would be an interest in Return on Investment (RoI).